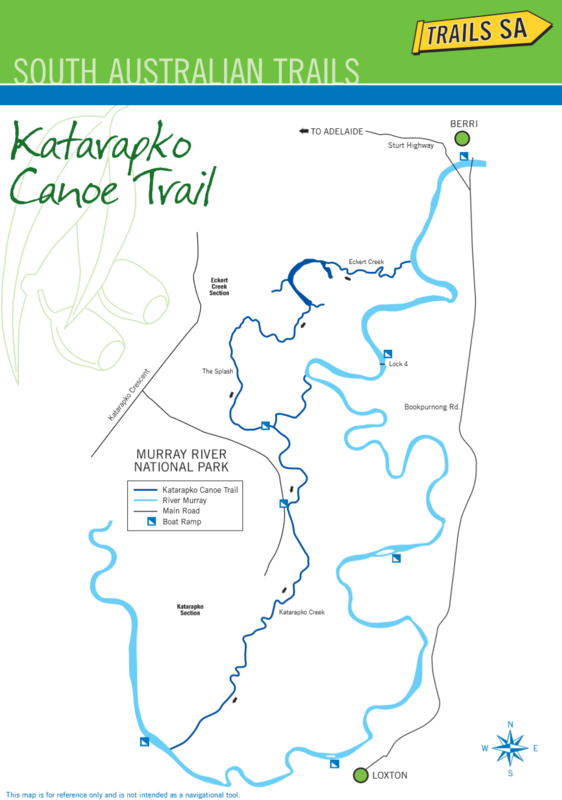 Katarapko Creek Canoe Trail is perfectly suited to a day paddle or overnight kayak/canoe camping. It is easily navigated and has many good campsites to choose from. Car access to launch and finish points is good. Paddlers with appropriate equipment and a basic skill level will find the Katarapko region an interesting and safe area to explore. Never the less, it is wise to take into account the planning considerations outlined at in the sections below. It is also important to know the weather forecast. It is recommended when embarking on any trip to ensure that at least two parties are aware of your intentions. This can be done by submitting a float plan with DEW or the police station nearest to where you plan to operate. Your float plan should also be circulated to responsible persons at home. For those with limited experience or those new to the area it is useful to speak to someone with local knowledge. DEW Berri (08) 8580 1800 or Canoe Adventures Riverland 04211 676 45 before embarking on a trip in the area. For a one way trip, a good option is to launch at Lock 4, three kms upstream from the where Katarpko Creek branches off from the Murray. Any designated campsite along the way is a possible finish point as they all have vehicle access. 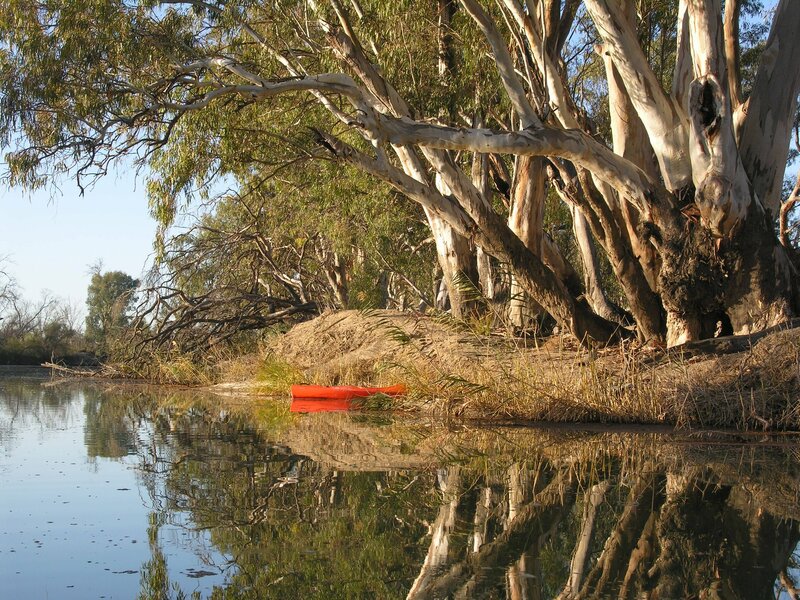 Most often paddlers finish at Milichs Landing (on the Murray just after the end of Katarpko Creek) or 6kms further along the Murray at Loxton. A launch and pick up service is available with Canoe Adventures Riverland: Ph 0421 167 645 (they also hire kayaks, canoes and camping equipment). A 40m portage is required around the Stone Weir on Katarapko Creek, but otherwise the paddling is easy – a good option for paddlers who haven’t canoe camped before. The Eckert Creek Section is best suited to paddlers with a moderate level of skill and experience. It has become narrowed in sections by the growth of reeds due to limited river flows and levels. This significantly improved in August 2017 when the Eckerts Creek inlet regulator was completed and average flows increased fivefold. Extensive works are being undertaken to rehabilitate this area under the Katfish Reach Project ( katfish.org.au ). It will have huge benefits to the whole environment as well as improved conditions for paddlers. The higher flows mean more assistance for downstream paddling, but also that caution and good paddling skills are needed when approaching snags and protruding branches. The increased flow has opened an alternative trail down the South Arm of Eckerts Creek (also known as “Jarrett Creek”). The South Arm leaves the main Eckert Creek approx. 1.3kms after the start of Eckert Creek and rejoins it at the end of Eckert Wide Waters. This trail bypasses the fastest-flowing narrow sections of Eckert Creek, as well as some of the more difficult-to-negotiate snags. In summary, the Eckert Creek section is a challenging but rewarding paddle, with shallow sections and several portages required (notably, around the new regulators). Note: it is important to gain current local information before planning an Eckert Creek trip, as environmental management occasionally involves increased flows and drying cycles for some sections. In the summer, day time temperatures can be over 40˚C and so adequate precautions need to be taken on those days, such as staying in the shade and minimising physical exertion during the heat of the day, drinking adequate quantities of water and wearing appropriate sun protection. During hot weather snakes may be encountered and canoeists need to be aware of where they walk and where they put their hands. A compression bandage and a knowledge of snake bite treatment is essential. During the warmer months mosquitoes can be a problem. Mosquitoes on occasions carry the diseases Ross River Fever and Murray Valley Encephalitis. To avoid being bitten by mosquitoes (a particular problem on dusk), clothing which covers all exposed skin plus an insect repellent is recommended. The insect repellent is handy to repel flies which can be a problem at that time of the year during the day. A tent with a good quality insect proof inner is recommended. During winter, on cold, rainy days with the effects of wind chill, hypothermia is a possibility and appropriate waterproof and warm clothing, shelter, stoves and food and water are necessary equipment in case of an emergency. Nights can be below 0˚C during winter and so a good quality sleeping bag and a tent are essential for overnight expeditions. After heavy rain the clay soils of the Riverland Parks floodplain become very boggy, and when necessary the Rangers close access roads to prevent damage to the environment. Even when the roads are open, vehicle users are strongly encouraged to avoid wet patches so as not to become bogged and can cause damage. Other hazardous driving conditions include corrugated track surfaces and narrow winding roads. Rainfall averages around 240mm per year, but is very erratic, varying from 150mm to 550mm per year. Most years have below average rainfall, with a few years well above average. Winter air temperatures are reasonably mild during the day and cold at night (averaging 4.5˚C and 16˚C maximum). Summers are long and warm to hot. The daily minimum (averaged over the summer months) is 14˚C and the average maximum is 31˚C. Temperatures in excess of 40˚C are common. The fire danger season for all Riverland Parks begins on 1st November and ends on the 30th April (this differs from the fire restriction dates set by the CFS). During this period only gas fires are allowed. There are no fires permitted on days of total fire ban. At other times campers are encouraged to practice minimum impact procedures by using a gas stove which is faster and cleaner for cooking. This will minimise the impact on the environment as trees and dead wood are homes for native animals. · Fires are only permitted in existing fireplaces which are provided at numbered campsites. River Red Gums are prone to dropping limbs without warning and it is therefore wise not to camp beneath them. The level of the water throughout the system can vary. Thus one must be aware that banks may be slippery, submerged logs may not be apparent, and the depth of water may vary greatly. In some of the creeks there may be a significant current, which means that paddlers need to be able to steer and control their boat confidently. This is particularly relevant when paddling with the current as paddlers can be pushed into fallen trees or other obstacles across the creek, resulting in a capsize and a struggle to get to safety. (Campsite 28 shown at right). In leaf litter, spiders, scorpions and other invertebrates are likely to be encountered which, with common sense, can generaly be avoided. If someone in the group has an allergic reaction to invertabrate bites, there are creams available from pharmacies which reduce the pain, inflamation and itching from stings which if included in your first aid kit, is generally all that is needed if you are unlucky enough to be bitten. When planning a trip it is wise to apply for permits as early as possible, because on occasions, the parks are closed for feral animal control. Dog owners are advised that dogs are not permited in the park and baits have been laid for foxes that are dangerous to dogs. In leaf litter, spiders, scorpions and other invertebrates are likely to be encountered which, with common sense, can generaly be avoided. If someone in the group has an allergic reaction to invertabrate bites, there are creams available from pharmacies which reduce the pain, inflamation and itching from stings which if included in your first aid kit, is generally all that is needed if you are unlucky enough to be bitten. When planning a trip it is wise to apply for permits as early as possible, because on occasions, the parks are closed for feral animal control. Dog owners are advised that dogs are not permited in the park and baits have been laid for foxes that are dangerous to dogs. When paddling in the Katarapko region, protective footwear such as sneakers, sandals or wetsuit shoes should be worn for protection from sharp sticks and stones, broken glass and bites. Sun glasses are recommended as protection from sunglare and head high vegetation. In the Katarapko area, there are two weirs at GR: 587989 (shown at left) and GR: 618028 which must be portaged around. At all times, paddlers must stay well clear of weirs as they pose a serious safety threat due to moving water. In the main channel of Katarapko Creek and the River Murray you might encounter power boats and tourist boats. The rule is to keep to the right of the waterway to allow them to pass on your left. This is particularly important on blind corners where power boats can approach at high speed. Close up, speed boats can make the river quite choppy, making paddling difficult for inexperienced participants. In strong winds the open areas of water can become quite choppy also. In windy weather a steep chop may develop which is quite hazardous for inexperienced paddlers. Small power boats (tinnies) frequent Katarapko Creek. To pass through Lock 4, you will need to make the Lockmaster aware that you wish to use the lock. You can either phone the lock master (8582 1388); signal by sounding three long whistle blasts; or land on the grass by the boat ramp and walk to the Lock office. When it is safe to proceed, the lockmaster will signal with a green light. Prior to this signal do not approach any closer than 150 metres. When it is safe to proceed, enter the lock and follow the Lockmaster’s instructions. Do not tie on to anything in the lock. He will signal when it is safe to exit the lock. The Lock operates between 8am – 11.30am and 1pm – 4.30pm every day of the year except Christmas day. Vehicles may be left at Lock 4 in the car park. However, the car park is locked up between 4.30pm and 8am. The boat ramp at Lock 4 is now closed to public use for motorized craft, but kayaks, canoes and other human-powered craft are still welcome to launch from the lawn next to the boat ramp. It is not practically possible to portage around Lock 4 (the bank on the upstream side is very difficult to access because of willow growth and portage distance is over 400m). Where to go, and what will I see? Sites of historical significance are clearly marked with signs. As mentioned in the Canoe Guide, there are many possible trips in the Katarapko region depending on the time available, the conditions and the water levels. Loxton Caravan Park, which is a good place to begin a Katarapko trip, provides a safe place to leave vehicles. 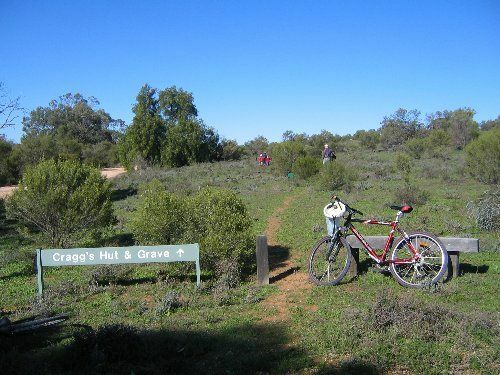 There is easy access to the walking trails at GR: 589940 and Cragg Hut at GR: 582952 from Katarapko Creek. Ajax Achilles Lake is an interesting side trip from the River Murray, although the entrances and exits may be hard to find among the reeds. Katarapko Island is a wild life sanctuary and its current condition is thanks largely to Loxton High School staff and students and Katarapko Community Action Group who work in conjunction to help restore and manage the area. There is an excellent interpretive sign just over the Berri Bridge on the Bookpurnong Road. It is important for paddlers to note that not all campsites are accessible from both the road and water. Remember to check your map when planning to ensure that you will be able to access your campsite.